Black Friday and Cyber Monday are fantastic opportunities for your business to make money. Previously, Black Friday has been one of the biggest days of the year for spending on the Internet. Running a successful Black Friday and Cyber Monday campaign can be overwhelming and stressful but it doesn’t have to be. 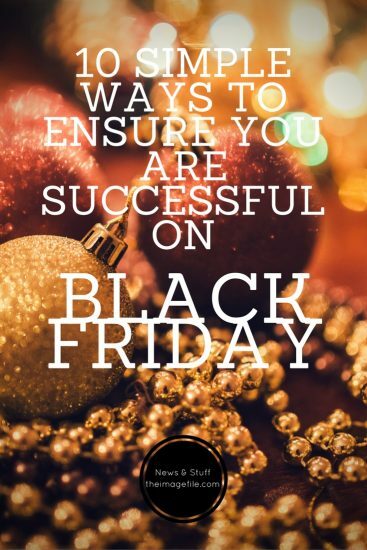 Here are 10 simple ways to ensure that you have a successful Black Friday. I know it’s easier said than done but try to organise and plan your sales in advance, rather than panicking two days before. Planning your sales can be as simple as taking a look at all the products, services and current discounts you have on offer and working out what should stay, what should go and what needs to be added in. Top Tip! Create a “planned sales table” in a programme like Excel or Google Sheets to give you a clear, simple outline of all your upcoming sales and offers. Not sure what to note down? The names of the products and services you intend to offer, the start dates, sales prices and any marketing you need to get sorted. Also work out how you are going to separate new and past customers, are you going to give exclusive access? Are you going to set up a different promo code giving them a little extra? Use graphics and visuals to promote your Black Friday, Cyber Monday and Christmas promotions on social media and through email marketing. Spend some time being creative and thinking about the design aspect of your marketing. Top Tip! Check out our Christmas social media downloads that you can use to promote your Christmas offers. Building suspense and a buzz around your promotions could potential increase your sales and boost your success. Why not tease customers with what’s coming up via email or post sneak-peeks on social media? The more buzz you can create the more momentum you will have during Black Friday. Abandoned carts are a trait that comes with the territory of an e-commerce business. However the average cart abandonment rate on Black Friday is a whopping 65%. Of course you want to keep that figure as low as possible and one of the best ways to do that is to create brilliant abandoned cart strategies. Top Tip! Send tailored emails if a customer adds a product to their cart or contacts you about your services, then never does anything else. That way you can contact them via a compelling email to bring them back to complete their purchase. Nowadays customers expect a lot of VIP treatment from brands so make sure you get on board. It’s 50% easier to sell to existing customers than to brand new customers, which means a lot of people you already worked with are far more receptive than those who just stumbled upon your work. Top Tip! Re-targeting past clients doesn’t have to be a long-winded process. Consider sending emails to your previous customers with great deals, sneak peeks, promo codes or exclusive news. You can download an email list of your past customers from Tools > Marketing > Email Export Tool. Think of a couple of Black Friday blog posts you can put out over the next couple of days. Blogging is a great way of keeping your offers in the clients mind without bombarding them. Also spreading your offers over your various social media platforms, encourage conversation between clients and answer any questions from your followers. Announcing your Black Friday sale. A teaser email and sneak peek of other sales that are to come. Exclusive promo codes or sales for your past customers. A last reminder before sales end. How many of us feel that customer service can sometimes go down hill when the Christmas rush sets in? So make sure you respond to your clients quickly and thoroughly as possible. The other thing to remember is to provide courteous and respectful responses, even to impatient customers. One thing that can save you time and stress is to have a few canned responses prepared in Gmail. Google Analytics is a powerful, free traffic tracking tool that every business should be using. If you’re not already set up with Google Analytics then get on it now. It will give you vital information on how your pages are performing and your bounce rate as well as how many people are visiting your site, where they’re based and how long they were active. The majority of businesses gain a significant customer boost during and around major holidays and events such as Christmas, wedding season etc. Why does your relationship with these seasonal clients have to end after the holidays? Take time to maintain and nurture your relationship with new customers. Stay active on social media and on your blog, and send out regular, informative emails. 12 Ways To Ensure You’re Successful On Black Friday 3 Pre-Back To School Marketing Tips 8 Ways To Prepare Your Business For Christmas April: What’s Coming Up?